Social Login is a free Drupal extension that allows your users to login and register with one click using their social networks accounts. This Drupal 8 extension seamlessly integrates with your existing registration system so that you and your users don't have to start from scratch. It helps increasing your Drupal user registration rate by simplifying the registration process for new users and provides permission-based social data retrieved from the social network profiles. Your existing users can furthermore link their account to one or more social networks and can then use these social network accounts to login without having to remember another username/password combination. The installation is not very complicated and should only take a couple of minutes. Please read our instructions carefully and do not skip any steps. 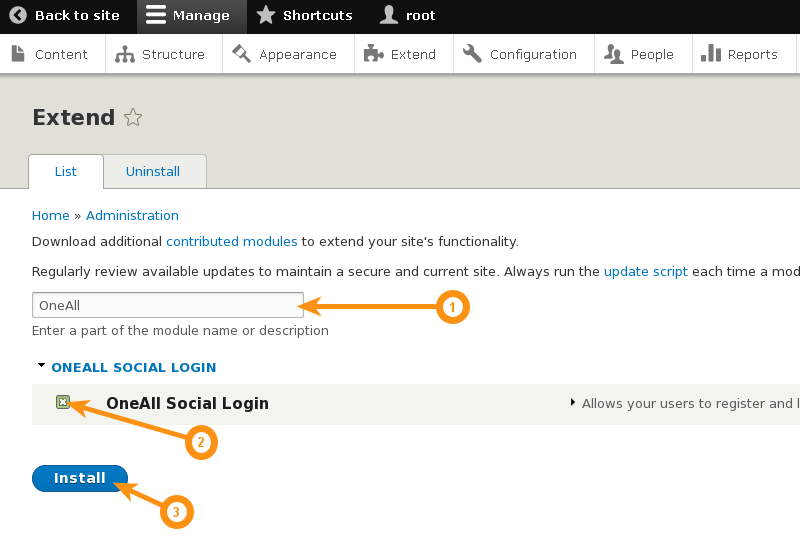 Login to your Drupal administration area and open the Manage \ Extend panel. 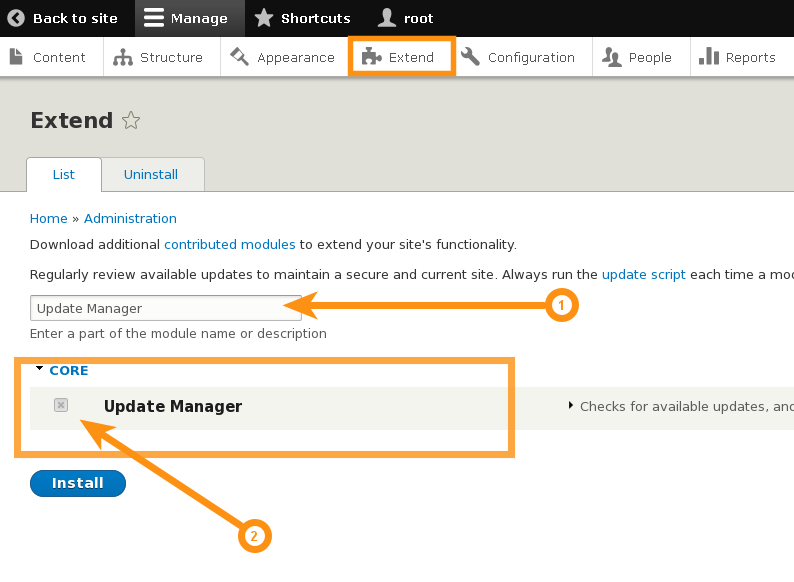 Search for Update Manager and make sure that the module is installed and enabled. 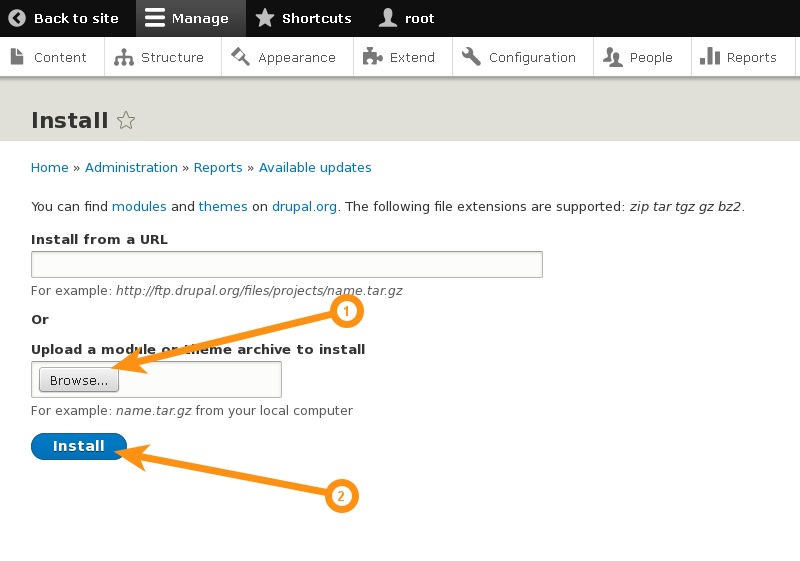 First navigate to Manage \ Reports \ Available updates and click on + Install new module or theme. Navigate to Manage \ Extend, search for OneAll, tick the OneAll Social Login checkbox and then click on Install. 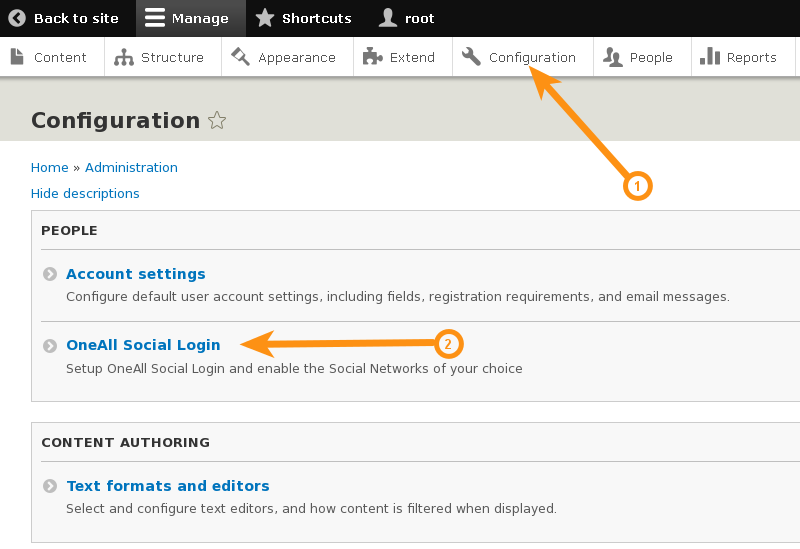 Login to your Drupal administration area and navigate to Configuration \ OneAll Social Login. Click on the Autodetect communications settings button. A green success message will be displayed if your server is able to communicate with the OneAll API. Your firewall must allow outbound requests (from your server to the OneAll API server) on either port 80 or 443. To obtain your API credentials, please login to your OneAll account and open the page Site Settings \ API Settings & Credentials of a Site. Fill out the API credentials in the Drupal administration area and click on the Verify API Settings button. A green success message will be displayed if your credentials are correct. Select the social networks that you would like to use by ticking the corresponding checkboxes in your Drupal administration area. Please note that many social networks require that the webmasters register their website before being able to use their services. To be able to use the plugin, you must therefore register your website. This process is straightforward and takes only a couple of minutes. It has to be done only once for each provider and we will guide you through this process. To setup your providers, please login to your OneAll account, select a Site and click on Social Networks. Please make sure that your firewall does not block outbound requests on both ports 80 and 443. One of these ports must allow outgoing requests (from your server to ours) so that the plugin can establish a communication with our API. Feel free to fork our Drupal GitHub repository to contribute to the development of this module.